Casanova is a half sized cigar, in that it is not intended to be cut in two. The small size of this cigar can satisfy one's need for a quick but definitively fulfilling smoke. Casanova can be consumed in a short time, great during a break having a good drink. Thanks to the small size, the quality of taste comes immediately after the first draft. 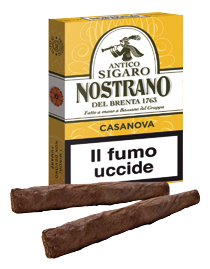 Taste: Woody and dried fruit notes are typical of fermented Nostrano del Brenta Tobacco. Manufacturing: Totally by hand with wrapper and binder using Tobacco aged at last three years and cultivated only in Veneto Region. After manufacturing Il Casanova mature at least four months and it's checked one by one from the cigar rollers to guarantee the best quality in every box. Ducale following the tradition of Antico Sigaro Nostrano del Brenta 1763, is a great size cigar, obtained by a careful selection of Tobacco Nostrano leaves, which have been aged for over three years before using them. 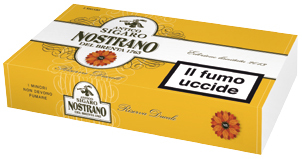 The typical aromas of Tobacco Nostrano del Brenta are enhanced by a specific manufacturing process, which provides leaves used in wrapper and binder of the cigar pass twice in the fermentation cell. The result is a strong taste with marked note of hazelnut, mild flavors and round scent. Manufacturing: Totally by hand with wrapper and binder using Tobacco aged over three years and cultivated only in Veneto Region. After manufacturing Il Ducale mature at least six months and it's checked one by one from the cigar rollers to guarantee the best quality in every box. 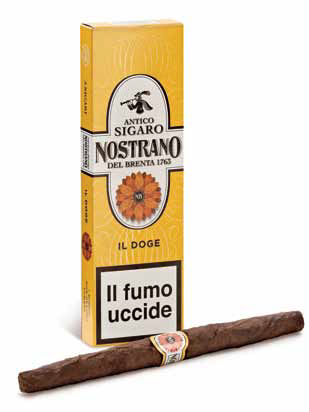 Doge is the first cigar made from Consorzio Tabacchicoltori Monte Grappa using Tobacco Nostrano del Brenta cultivated only in Veneto Region. 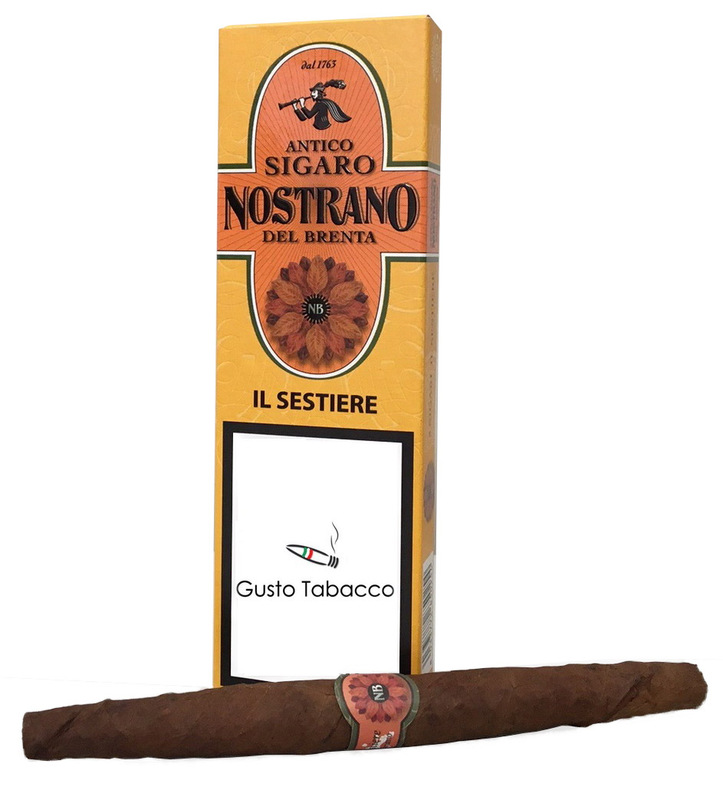 It's the more typical Nostrano's Cigar, made following the manufacturing process handed down from generation to generation, during more than four centuries. The size is great, obtained by a careful selection of Tobacco Nostrano del Brenta leaves, which have benn aged for three years before using. The taste are sweet, mild, soft and never aggressive. Manufacturing: Totally by hand with wrapper and binder using Tobacco aged three years and cultivated only in Veneto Region. After manufacturing Il Doge mature six months and it's checked one by one from the cigar rollers to guarantee the best quality in every box. Riserva Ducale is a particular selection of the Ducale's cigars, made using the best Tobacco leaves selected for the Ducale cigar aged more than five years. The typical aromas of Tobacco Nostrano del Brenta are even more enhanced by the specific manufacturing process used for Ducale and the aging of Tobacco. The result is a strong taste with marked note of hazelnut, mild flavors and round scent. Manufacturing: Totally by hand with wrapper and binder using Tobacco aged over five years and cultivated only in Veneto Region. After manufacturing Riserva Ducale mature twelve months and it's checked one by one from the cigar rollers to guarantee the best quality in every box. The aromatic notes of this cigar come from the careful selection of the best Nostrano Tobaco leaves and from the fermentation and maturation process used for it. This cigar develop balsamic and liqueur-like aromas, with sweet and floral notes, mature hay, wood, dried fruits and leather. 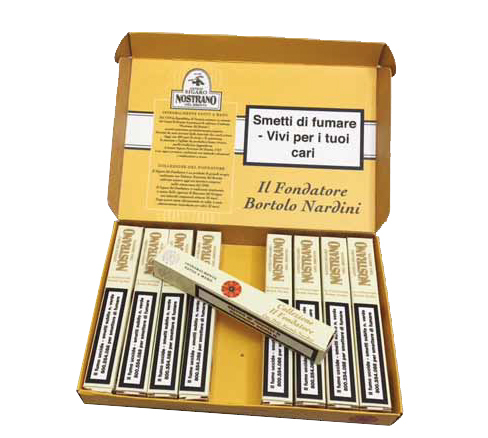 Il Fondatore is a product of the highest level, made whit Nostrsano del Brenta Tobacco originally from Havana cultivated in Veneto Region since 1550. This cigar is dedicated to Mr. Bortolo Nardini, the first grappa producer in Italy and one of the founding member of the Consorzio Tabacchicoltori Monte Grappa (Consortium of Tobacco grower). The dimension are extremely generous, it has a conical form and is created to smoke whole, not cut. The particular manufacturing process for Il Fondatore make the smoke round, full, satisfying whit an interesting evolution of the taste. Th aroma are liquorice, wood and walnut. Manufacturing: Totally by hand with wrapper and binder using a blend of Tobacco Nostrano del Brenta aged at last three, four and five years. After roling, Il Fondatore is re-fermented in the curing chamber and further matured for another 12 months. Compliance with quality standards is guarantee by numerous checks made throughout the production chain and on the final product.